One of the biggest struggles I hear from college students is about how to have a productive study session. All the intentions to get down to business are there, but something always seems to get in the way of actually getting quality work done. For some students, it’s the temptation of distractions that gets to them. For others, it’s having the feeling of exhaustion and saying I’ll do it tomorrow. Every college student has struggled with productivity at some point, so don’t get discouraged if you find yourself going down the same path. To help you get back on track, try some of the following tips! One of the things I talk about in my free course, Productive Planning, is creating goals so that you have something to focus on. This is extremely important if you struggle to get motivated because it forces you to reflect on why you’re really here. I know a lot of college students have goals, but do they really write them down? If you’ve got tons of “goals” floating around in your head but haven’t written them down, then can you really expect to be held accountable to them? For most people, the answer is probably no. The thing about writing our goals down is that it gives us a sense of purpose (and accomplishment when we actually achieve them). 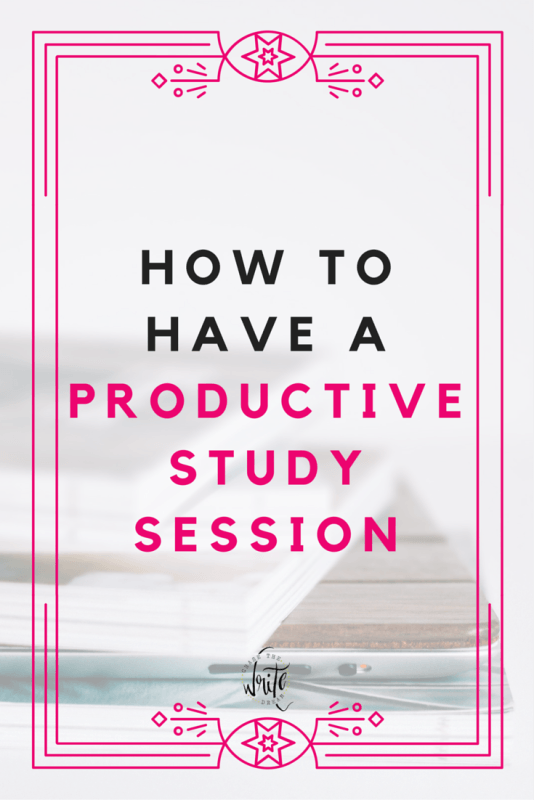 So grab yourself some sticky notes, a whiteboard, or something else you’ll see frequently, and write down at least one goal that you have for this study session you’re about to complete. You may also want to write down any weekly or monthly goals you have! If you need help outlining your goals or just getting started in the first place, then head check out Be a More Productive College Student in 7 Days. Look, procrastination happens to the best of us. I remember getting sidetracked by my favorite TV show on numerous occasions (which I often regretted after because I would stay up late just to complete an assignment). In order to stop procrastinating, you need to face your distractions head-on. That means studying in a place that is away from any technology (that includes your phone if you’re one of those people that checks it every five minutes), away from friends (if you are likely to chat rather than actually get work done), and comforting to your brain. Well, it means finding and environment that your brain feels calm in. Personally, the library was the exact opposite of that for me. I always got a brain block when I went to the library for anything. I’m not sure if it was the fact that I knew people could watch me study or that I couldn’t have some soothing music on in the background, but whatever the case, I knew I wasn’t going to have a productive study session there. Don’t be afraid to go explore your campus a bit so that you can find the right location for you. Who knows, maybe the hallways outside of one of your lecture halls is going to hit the spot! Do yourself a favor – Don’t feel as if you have to study the same subject for hours on end in a row. Your brain needs time to sort through information so that it can recall it later, so all of those cramming study sessions you’re doing probably aren’t going to be as effective as you hoped. To offset this drain on your brain, try mixing up your material a bit. For example, you may choose to study psychology for an hour, then switch to economics for an hour. You could also include a quick break in-between to grab a snack, do some quick stretches, or check your technology (just make sure you set a timer so you don’t stay on there for an extended period of time). The whole point here is to change up your studying a bit so that you aren’t falling asleep from boredom, and so your brain has a chance to retain the information you’re feeding it. I’m sure you’re wondering what priority #1 is. Well, the answer is simple – It’s self-care. College students are probably the worst when it comes to taking care of themselves. So many are sleep deprived and eat junk food way more than they should because it’s a quick way to fill the stomach. Unfortunately, when you don’t practice self-care, you’re probably not going to have a productive study session because your brain and body won’t have all the energy that is needed to stay focused and alert. 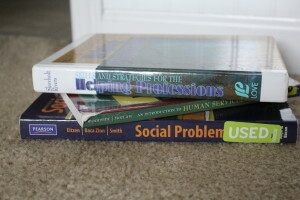 If you need some ideas for how to keep yourself healthy in college, then read Practicing Self-Care in College! The harsh reality is that you are your own worst enemy in college. If you don’t make an effort to change something that isn’t working, then you can’t expect to do better both inside the classroom and outside of it. Being productive requires experiencing a little discomfort at first because you are literally changing habits that have been embedded in you for years. I talk more about all of that in Stress-Free Scheduling, my in-depth course on time management and productivity, so if you could use the extra help with getting on the right track, then go check it out! But for now, I want you to focus on just one thing that you can do today to start making your study sessions better. Write that idea down and then use it to build momentum to tackle the other areas that might not be as easy to fix. Eventually, you’ll find that you do have control over the procrastination and all the other distractions in your life that are keeping you from having a productive study session. Don’t let your dreams pass you by, friends. Put in the effort now so you can reap the rewards later! Hi Aly! I’m glad you enjoyed it 🙂 I feel like there are SO many distractions nowadays. It’s hard to get yourself to focus on the tasks at hand when the world is literally at your finger tips! I absolutely love this post! I definitely think outlining the things you need to do helps to organize your thoughts and get things done faster. Thank you for sharing!